Learn how to make this classic origami hopping frog! This is such a fun thing to do with friends, have a frog hopping race or see whose frog hops the furthest! This is a traditional origami model that starts with a single rectangular sheet of paper. For best hopping results use stiff paper such as an index card or you could also fold a square sheet of paper in half and start with that. For the tutorial I used brown kraft paper, Click here for my origami paper recommendations, or to save money check out my money saving tips on origami paper alternatives. 1. Starting white side up. 2. Fold the bottom left corner up and align with the top edge. 3. Bring the top left corner down aligning to the bottom edge. 4. You should now have an X as shown. 5. Flip the paper to the other side, keeping the X on the left. 6. Fold the left edge over to the right, using the center of the X as a guide. 7. Open the last fold. 8. Flip the paper back over to the other side. 9. Fold the left side in, collapsing the top and bottom corners into the center. 10. This is now a water bomb base with extra paper. Rotate the paper so that the triangle is at the top. 11. Fold the front layers up to the top roughly as shown. 12. These are the front legs of the froggy. 13. Fold the right edge to the middle. 14. The leg will stick out a bit sometimes. Do the left side next. 15. Fold the paper down, at the point indicated. 16. Depending on your paper size, you might have an overlap, you can cut this off, or fold it and then reverse fold it so that it's on the inside. 17. Fold the Flap down. 18. You can adjust where you fold it, try out different amounts, see who can get the biggest frog hop. 19. I decided to fold my extra section up again, it still hopped ok! 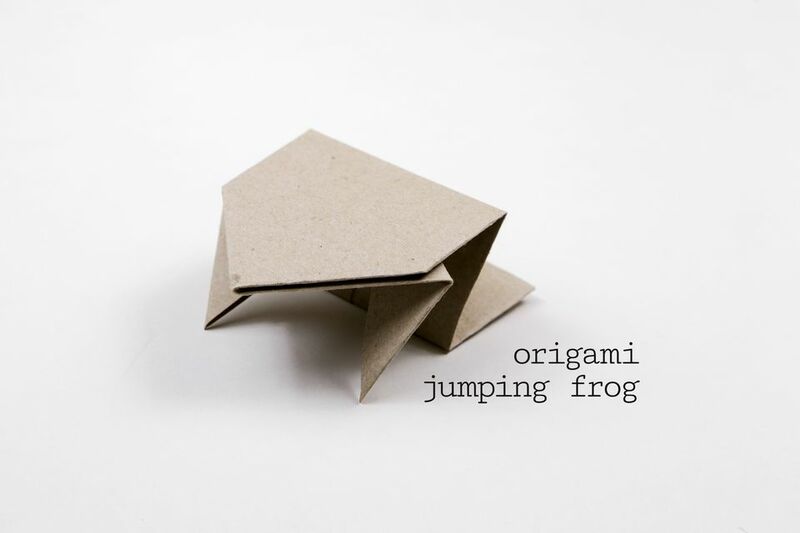 How to Fold an Origami Jumping Frog!